The MistyMate 10 Classic is a hand held portable mister that is easy to operate during your favorite outdoor activity. An ultrafine mist is created when pressure is applied to the bottle with the hand held pump. Less than 2lb. when full. Lasts an average of 1 � to 2 hours when used intermittently. 3� of coiled polyethylene tubing. Badge Clip to make mister �hands free�. Can fit in most bottle holders of a bicycle and most cup holders. MistyMate� is the world�s leading manufacturer of consumer mist products. 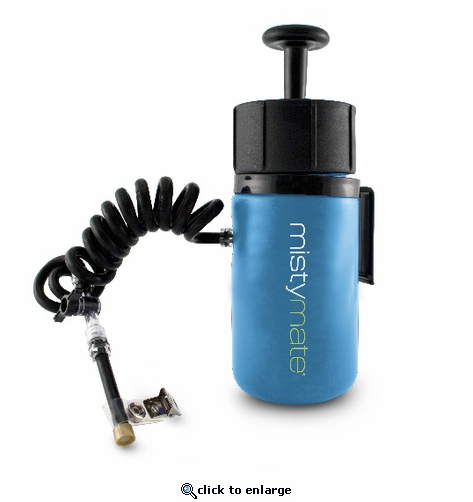 Founded in 1989 with the invention of the world�s first pressure operated personal mister, MistyMate� personal misters emerged as the leading brand in the newly founded industry and still retains that title more than 20 years later. Today, MistyMate� personal misters has expanded its scope to encompass a varietal product line while remaining faithful to its commitment to produce unparalleled never-before-seen consumer mist products.